Up until 10 months ago I had not heard about Sociodrama, Psychodrama or Jacob Moreno at all. At the end of 2017 I was looking for more action-oriented ways of working with groups. 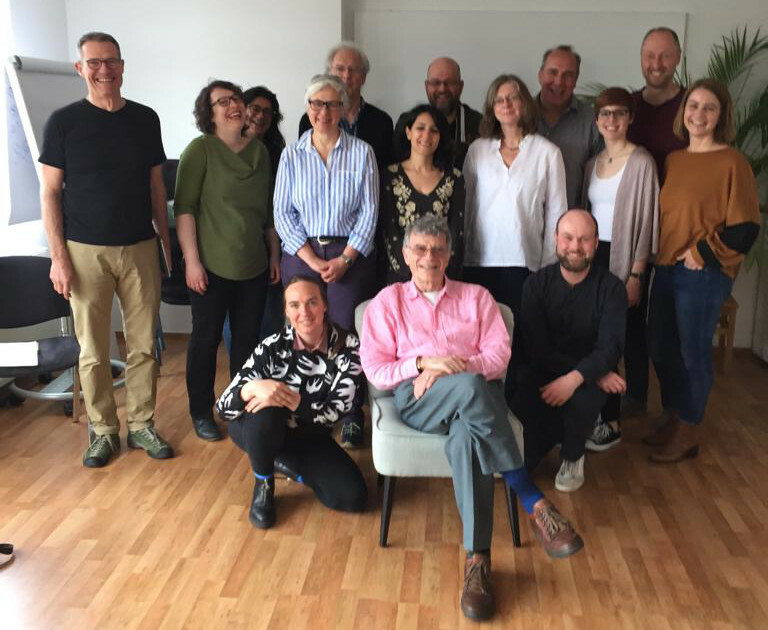 I stumbled upon the „Soziodrama Akademie“ in Berlin where Dr. Ron Wiener and Di Adderley were about to give the first-ever Sociodrama course in Germany. This course was also Ron´s last training course before retiring from being a trainer (he still works as a sociodramatist). So after our class in April I had the chance to ask him a few questions. Since our interview in April, Sociodrama has influenced my professional life a lot. I participated in several sociodramas as part of the Soziodrama Akademie. I directed my own sociodramas. And I used vignettes in our workshops and offsites. Each time people had fun and made meaningful experiences at the same time. You will find some impressions in this article. Joerg Jelden: Ron, thank you so much for taking the time to do this interview after three intense days. I feel very honored to have the opportunity to interview you, as this was your last seminar before you retire as Sociodrama teacher. I have two goals for this interview: I would like to introduce Sociodrama to people who’ve never heard of it. So I would like to talk about stuff that we did during our seminar at the Soziodrama Akademie in Berlin. And then I am interested in your opinion on the state of Sociodrama and its future, if that is OK for you. Joerg Jelden: The first questions is very basic: What is Sociodrama and what does a sociodramatist do? Ron Wiener: Sociodrama comes from Jacob Moreno who invented two disciplines: Psychodrama and Sociodrama. Psychodrama is an individual telling a therapeutic story within a group context. Whereas in Sociodrama, the group is at the center. 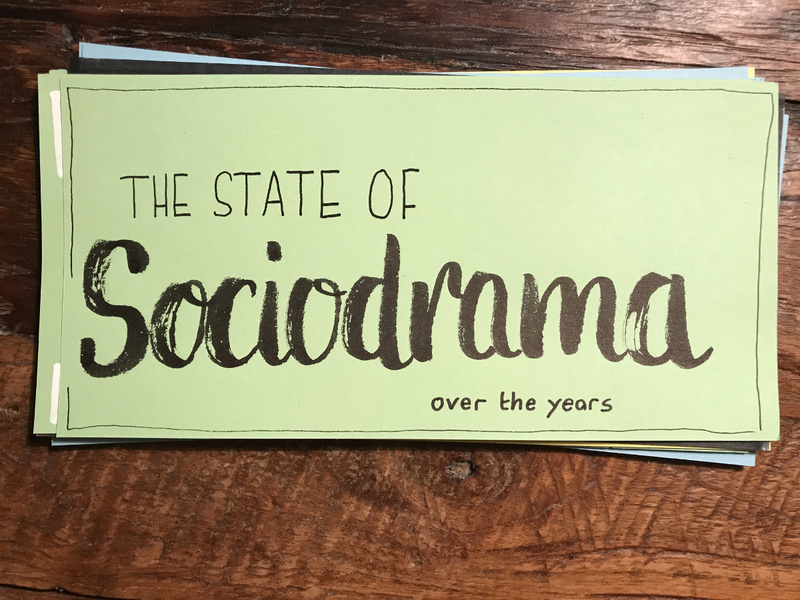 So an easy definition of Sociodrama is: it’s an action method to help groups better understand their situation and – where appropriate – to change it. 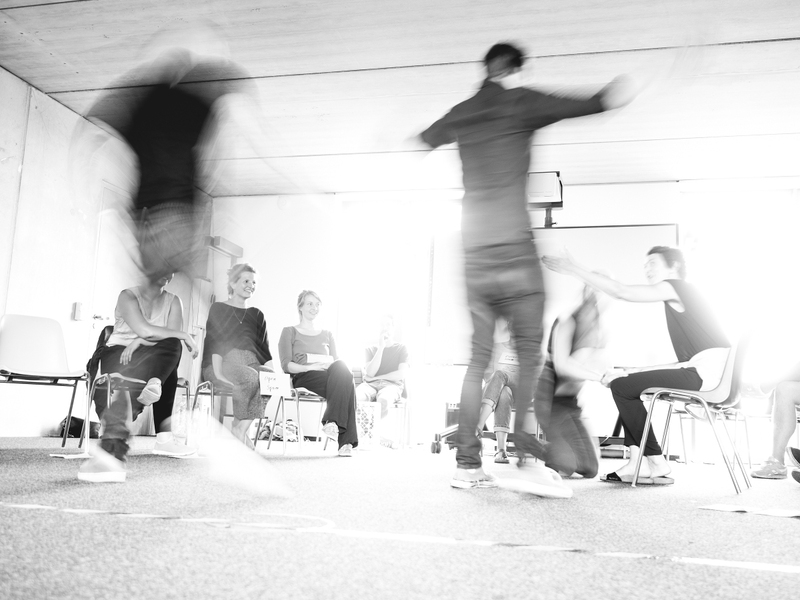 As a sociodramatist you guide the group through this process using action methods. And by action method I mean the opposite of sitting down and somebody in the front lecturing you. Joerg Jelden: Many people in organisations have experienced workshops and offsites where people talk and discuss a lot. But there is very little in terms of making new experiences. Why do you consider experiences so relevant? Ron Wiener: I think there’s quite a lot of evidence which says that you learn a certain amount when you sit and listen to something. You learn a bit more when you see something enacting in front of you. But you learn the most when you are also part of the action yourself. So with a Sociodrama you can act out your group story and have a shared experience together. Joerg Jelden: One of the main theoretical foundations of Sociodrama is Moreno´s role theory. What are his basic assumptions? Ron Wiener: Basically what Moreno says is: “We are the roles that we have.” He talked about somatic roles which are the basic roles of sleeping and eating. He talked about personal roles from which he developed psychodrama. And then he had social roles which are collective roles like mother, father or doctor, from which he developed Sociodrama. In Sociodrama we’re looking at the roles which are present in a group story. If we were looking at the family we would be looking at the social roles of mother, father, daughter, son, grandfather and grandmother. But we also recognize that there’s a personal aspect to any role that we actually play. You might be a miserable grandparent, you might be a happy-go-lucky mother and so on. 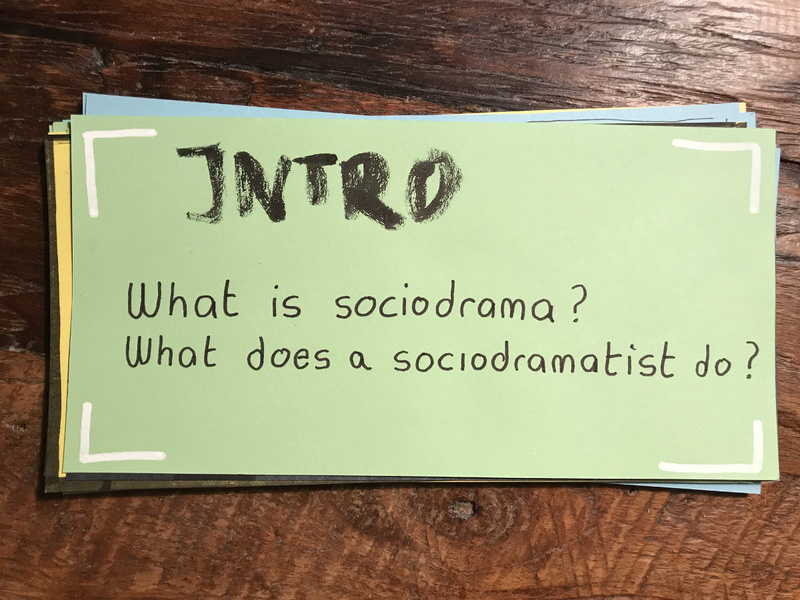 Part of what Sociodrama does is to help people exploring the roles they play, to widen their role repertoire, and to better understand other people’s roles primarily through role reversal by taking the role of somebody else on a temporary basis. Joerg Jelden: Once you work in a sociodramatic way, does it mean that you stop acting as yourself but rather slip into a certain role? Ron Wiener: Generally, that’s the case. On our first day we started with a so-called protagonist-centered Sociodrama where you’re starting off one person’s story. You are creating models within a story which help you better understand that story. And you’re also putting a bit of yourself into the story, where aspects of the story have attached to your own personal life. Joerg Jelden: By working with you, I have experienced that most of these roles are created on the spot, and the story is developed spontanously. Ron Wiener: It depends on how the sociodrama has been set up. If suddenly you would run a sociodrama about global warming then the topic is chosen beforehand and some of the roles will appear while there is a lot of space for new roles. In other situations, where we’ve developed the story during the day, the roles will emerge as part of telling the story. And if your task, perhaps, is some sort of team development which includes Sociodrama, then the roles will be primarily those that exist within the team or within those social forces affecting the team side. 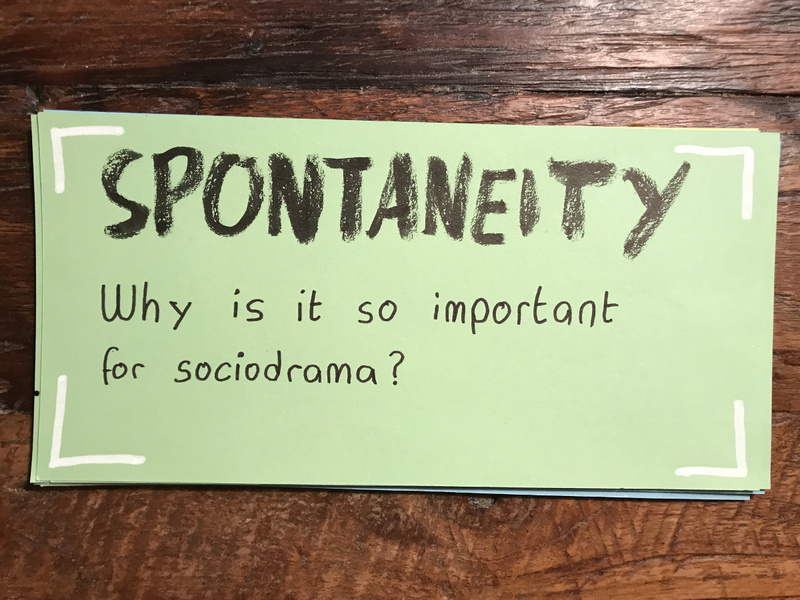 Joerg Jelden: Sociodrama is based on spontaneity. Roles are created on the spot, scenes are developed by the group, and the director decides about his interventions as the play enfolds. Why is spontaneity so important? Ron Wiener: Because it’s one of the things that we tend to lose as we grow up and life becomes routinized. Spontaneity – particularly in the present world – is something which enables us to work creatively in new situations or to develop new ways of responding to existing situations. Joerg Jelden: Sociodrama usually has three stages. The warm-up, the enactment, and the sharing. What I experienced from working with you is that there are strings of different warm-ups in order to warm-up to different aspects or topics. That was completely new to me. 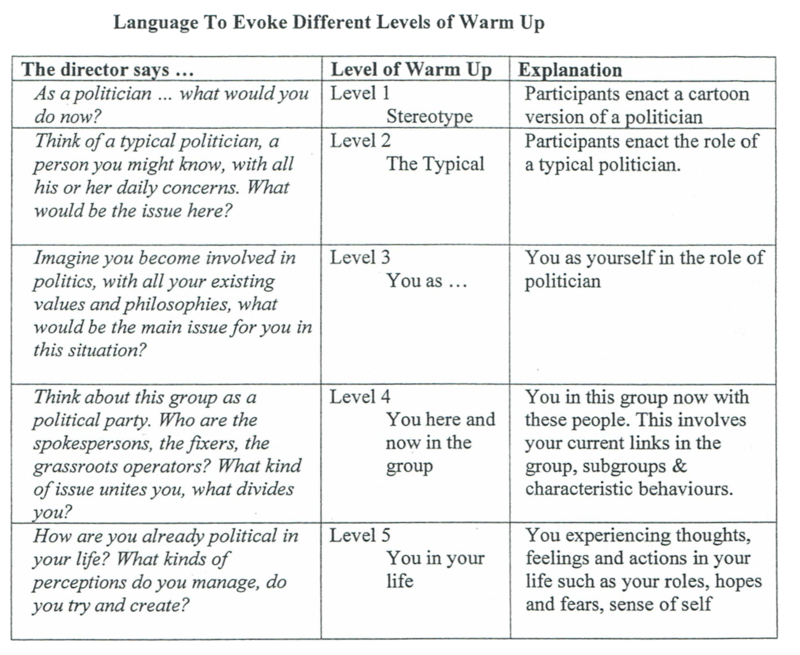 Why do you need more than one exercise to warm people up in Sociodrama? Ron Wiener: Essentially, we do a variety of different warm-ups. You have to warm up people to the room they are in. You have to warm up people to be present. When you are beginning to tell a story then you also have to warm up people to specific roles. But that is more or less the following stage already. Joerg Jelden: Tell me a little bit more about warming people up to roles. Ron Wiener: There are different theories to it. If we take the theories of sociodramatist Rollo Browne and Warren Parry, you can talk about roles developing through a number of stages. Initially, roles are often being played at the stereotypical level. But maybe you want to add a bit more depth to it. When you start playing a doctor you exaggerate what you tend to know about a doctor. Then you might put a stethoscope on or something to replicate that. But we actually have real-life experience with doctors and you can add some of that knowledge. To deepen the role further you can think about what sort of doctor you would be if you became a doctor yourself. And then you begin to think about who am I in this group that’s here today, so there’s something else about role identity there. Finally you are thinking about times in your life when you’ve acted like a doctor. When you had an emergency or something, and what did you do then? These are all different things that you can bring into the role. Joerg Jelden: As a sociodramatist you have to decide what depth of the roles the story needs? Joerg Jelden: Let us talk about directing the play. My first impressions with Sociodrama were that interventions are very related to theater. Can you tell me a bit about the interventions you can use as a Sociodrama director? What’s in your action methods toolbox? Ron Wiener: Basically, what we are trying to do is to help the group look at a situation and understand the systemic factors. What has created the problem in the first place and where are the possible points of change. You can help the group to move through one or more scenes which enables that story to come to life in a way that people can understand the roles and the systemic factors which are governing the story. Joerg Jelden: Once a scene is set up and the group is playing you as a director might want to intervene at some point. What are the sociodramatic interventions? Ron Wiener: In any conversation there are things that are said. And there are things that are thought and felt, but not said. Doubling is a technique to enable the unspoken thoughts and feelings to be expressed. And sometimes when an action is happening, people will actually want to become part of that story. With Tagging people can touch or tag those in role and take that role. You can role reverse and help people better understand someone else’s viewpoint. You can create new roles into a story when they are seen to be necessary. Joerg Jelden: We worked a lot with chairs today. 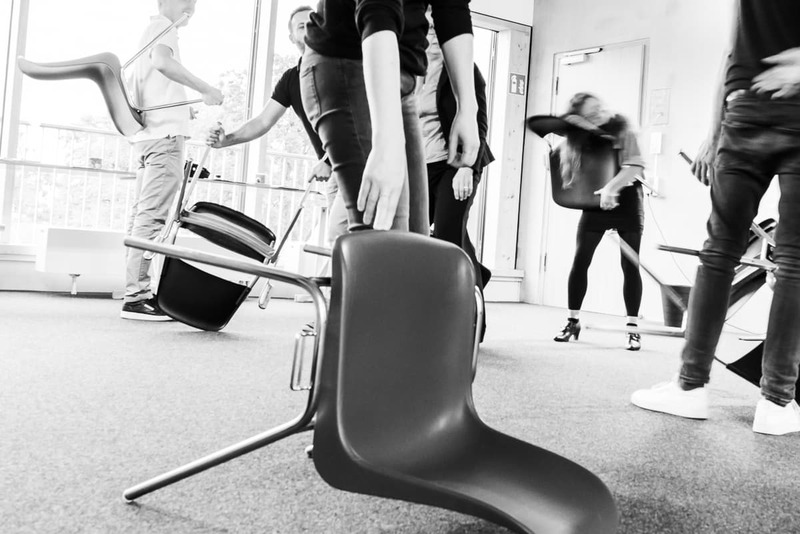 What is special about working with chairs? Ron Wiener: Chairs actually hold the role. Therefore, someone can leave a role. Someone else can take it over when you know where that role is, because that particular role was held by that chair in that particular place in the room. Joerg Jelden: Let us imagine: The performance is developing and you have to decide, do I intervene as a director or not? Do I let it go? Do I offer something? Do I make a change? And how do you decide what kind of intervention to use if any at all? Ron Wiener: If the story has begun to run out of energy, particularly, you have four choices as to how to take it forward. You can use your own intuition, you can think about the logic of the story, you can go back to the particular contract with the group, or you can begin thinking about ´Where is the energy flowing?´ These are four different factors which will help to influence the choice of direction that you take as a director. Joerg Jelden: Cool. Which also means that a totally different story could emerge in a reenacted sociodrama? Ron Wiener: Of course. Yeah. Any story could go in many directions depending on whose story it is you’re telling. Joerg Jelden: Do you sometimes regret your choices as a Sociodrama director? Joerg Jelden: What I experienced from participating in sociodramas is that afterwards I had the experience, “I should have done this in that role,” which followed me for like two, three hours afterwards. Ron Wiener: You always have choices. But the main point is that you learn, even if the role is not working or the story line is not working. That is still giving you information about yourself or about what’s happening on the stage. You can then use that information. That is why the sharing part after the enactment is so important. Joerg Jelden: Usually the workshops I facilitate are very strong on results. What I discovered by participating and directing sociodramas is something completely different. Sociodramas offer a deep experience of the issues. So how do you deal with actionable results in Sociodrama? Ron Wiener: It depends on the contract that you’ve got. Generally, you are concerned about whatever the issue or problem is. If you’ve been brought in to use Sociodrama for team development then you would hope that one clear end result would be that the team is more cohesive when you finish. The general idea is to create strong experiences and insights and then use that to develop it further into results. You might be able to derive actions and tasks in the final discussion at the end of a sociodrama. Joerg Jelden: You taught us a little about your life in a psychodrama earlier today. What fascinated you about Sociodrama? Ron Wiener: I think it was a way that would be working for many people in groups that I was working with at the time. But also, it was a way which fell into my socialist’s belief in terms of empowerment and empowering people to find ways of taking control. And with Ken Sprague I had a very inspiring teacher. Joerg Jelden: You have been involved with Sociodrama for quite a long time. 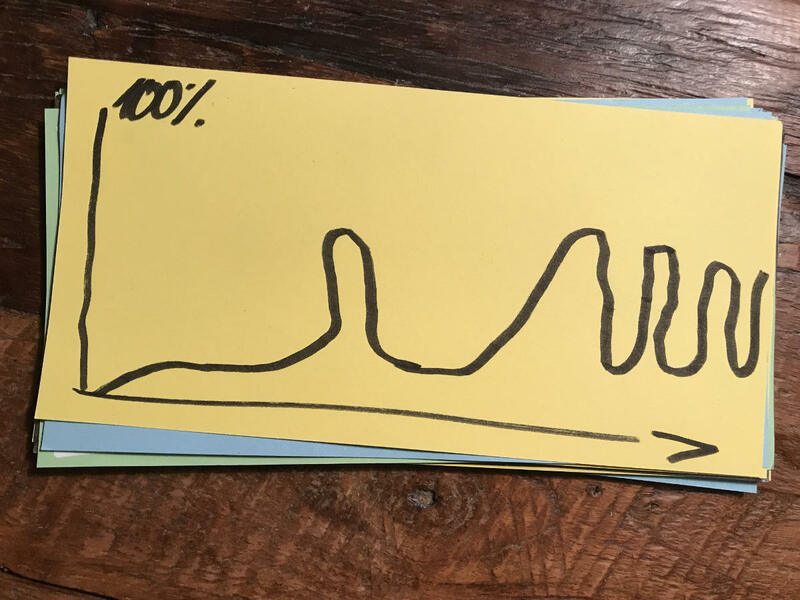 I would like you to draw a graph of your Sociodrama experience. The vertical axis is your happiness with Sociodrama. And the horizontal axis is the development over time. Ron Wiener: It starts off quite low because of the whole struggles with the British Psychodrama scene. It goes to a peak when I was working with Francis Batten. And then he died, so it drops off again. Then as we developed trainings and built up more people it comes up to here. At some point we began to realize that Sociodrama has not a great potential for many people to actually find jobs as sociodramatists. It’s useful as a toolkit for those people who work with groups. To summarize: It is slow in the beginning, then it rises, then the pace, then it gets down, then it goes up and down, up and down. But it is sort of fairly high up at the moment which is good. Joerg Jelden: Why do you think it is up here at the moment? Ron Wiener: Because of the Sociodrama and Creative Action Methods Network. And because I can see a strong base for Sociodrama in Europe. Not so much in the UK, but in Germany and in Switzerland in particular. 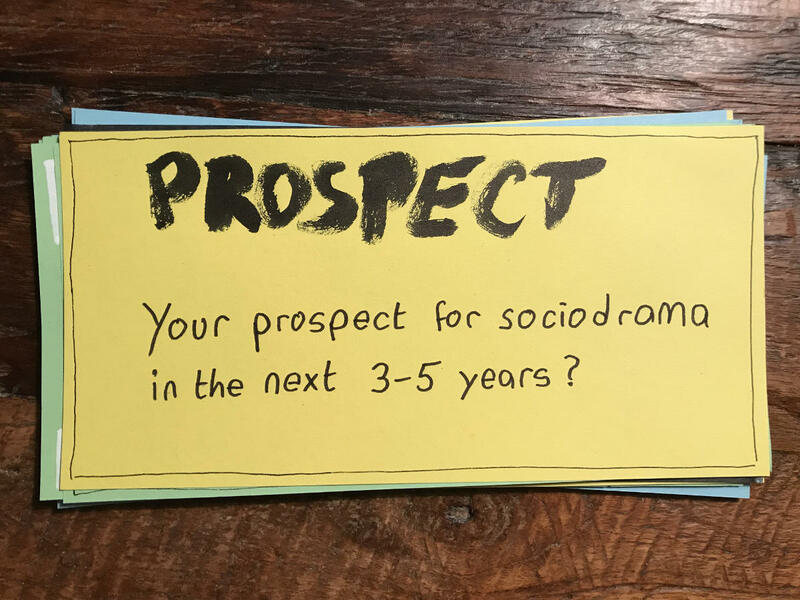 Joerg Jelden: So what is your prospect for Sociodrama in the next few years? Ron Wiener: I think two things. I think that in terms of the rapidly changing world we live in, things like creativity and spontaneity are important life skills. So I think Sociodrama has something to give there. Also, instead of people focussing on doing full sociodramas we need more people being schooled in using a variety of action methods. I think that it’s useful to know how to do a sociodrama, but I think what most people want is facilitating action skills that they can actually use as part of their organization consultancy or group work. That is where the future lies. 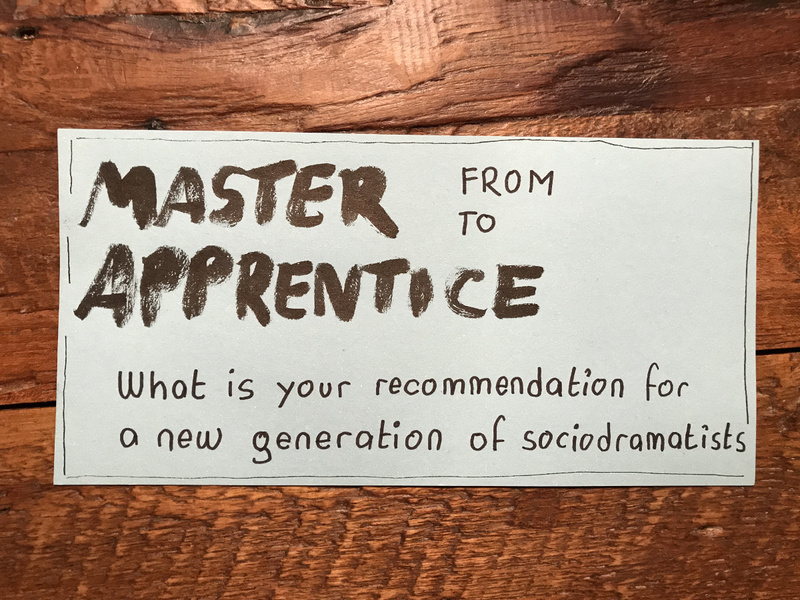 Joerg Jelden: This was your last teaching class and it was my first Sociodrama course, so the last question is one from master to apprentice: What is your recommendation for the new generation of sociodramatists? Ron Wiener: Well, Sociodrama is something that should be done out there. My recommendation would be just as is happening here, to set up what I would call the „social lab“. 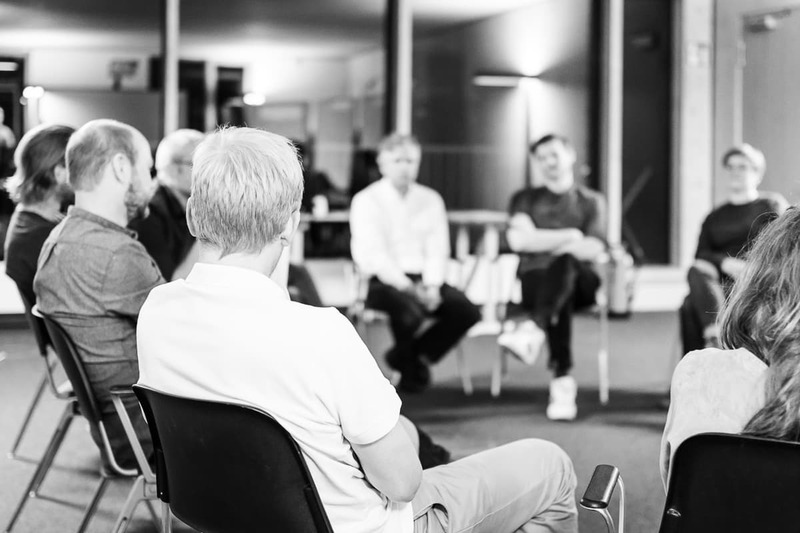 Like an ongoing group where people can meet and exchange ideas, practice their skills and get feedback and supervision when they do some action. I think that provides a framework for people to continue in development. Joerg Jelden: Cool. Thank you very much. 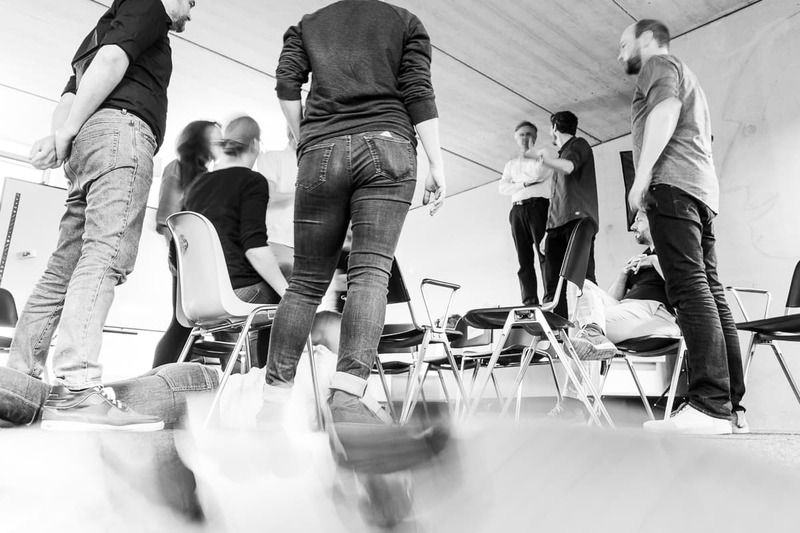 Do you want to do Sociodrama yourself? Hope in troubled times. Soziodrama Tagung 2019 in Frankfurt, Germany. May 3-5, 2019. 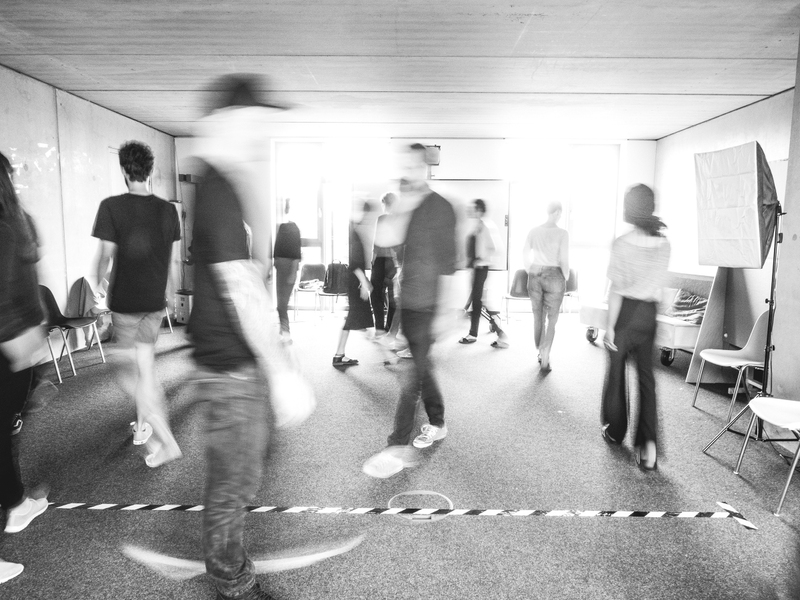 We will run open sociodramas in Hamburg and Berlin every now and then. Please drop us an email, if you are interested in participating.